Tour Description - Don’t miss Hawaii’s #1 attraction! A 5-hour “must see” deluxe tour visiting Oahu’s most historic landmarks, including a reserved ticket to the World War II Valor in the Pacific National Monument with Arizona Memorial, Punchbowl National Cemetery and Downtown Honolulu. Enjoy a unique and total experience with our original in-depth video, professional and friendly Royal Star driver, and mint and hand towelette service, all in the comfort of a Royal Star vehicle. Vehicle: Royal Star gold category vehicle (Van, Mini Coach or Motor Coach) for touring in comfort, plus video system, seat belts and professional driver. Wheelchair lift available upon request with 24 hours advance notice. *For security reasons, no bags, baby strollers or other items which offer concealment are allowed at the Memorial. 8:00 a.m. 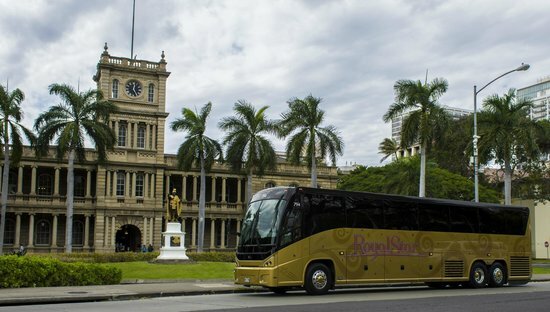 Pick-up in Waikiki by Royal Star vehicle, including a video presentation of tour agenda and history on passing landmarks. 9:15 a.m. Full Pearl Harbor experience, including reserved tickets and viewing of a 20-minute documentary film, museum, and tour aboard the Arizona memorial. 11:00 a.m. Professional and friendly Royal Star driver will serve mints and hand towelettes before embarking on the second phase of this tour. 11:30 a.m. Visit Punchbowl National Cemetery and Downtown Honolulu. Driver narration and original onboard video will elaborate on the U.S. military in Hawaii, information about Punchbowl, and life in Hawaii during World War II and at present, highlighting the state capitol building, lolani Palace, Chinatown, and more. 1:00 p.m. Drop-off in Waikiki.